This account concerns our grandchildren, Sarah (27 months) and Elizabeth (8 months). Their family moved into a new apartment and almost immediately the older child, Sarah, became ill with sinus drainage that provoked severe ear infection, coughs, etc. The doctor put her on a strong oral antibiotic. She was never well for more than two weeks at a time from then on. Neither child slept well, night or day. Sarah seemed more affected. She lost her former happy disposition and became rebellious, sometimes crying, and biting. We prayed for her but she only seemed to get worse. One day, Elizabeth, the younger contracted stomach flu. At the same time Sarah tumbled down the stairs banging herself badly. That night she began vomiting. The next day the parents brought both grandchildren to our home. Sarah was lethargic and could keep nothing on her stomach, not even water. Cool baths did help to reduce her temperature and the doctor said that she had a chronic ear and throat infection and swollen glands all over her body, even in her stomach. She was given a shot and sent home to rest. She did not improve, did not even have energy to sit up. Her eyes rolled back in her head and she was limp like a corpse. Even the tiny amounts of liquid we managed to get down her came back up and her mouth dried up, cracked and bled a bit as she slowly dehydrated. Realizing the child would die without help, we called a some friends to help pray. Six of us gathered around her and called upon the Lord. We rebuked the spirits of Infirmity, Upset Stomach, Fever, Respiratory Ailments, Swollen Glands, Infection, Witchcraft, Death, Starvation and Dehydration. Then we began to praise the Lord claiming her healing in the name of the Lord Jesus. Shortly afterward, her eyes popped open and began to focus and sparkle as she sat up! Happily we made her comfortable on the bed and filed into the kitchen for a spaghetti supper. The little girl soon appeared and said she was hungry. We watched in amazement as she ate a large helping of spaghetti without any ill effects. She played for a while, went to bed and slept soundly through the night. After breakfast the next morning my daughter and I took authority over the remaining spirits and commanded them to leave also. In short order they began to do this and she heaved several times. An awful odor came from her mouth. It was terrible and still coming out nearly two hours later! I had never smelled anything so vile. Following this she began to regain strength and energy rapidly and felt fine. How did this happen to the child? Investigation revealed that the owners of the apartment house were involved in witchcraft and all sorts of occult experiments. There was a huge stuffed owl and a collection of books and encyclopedias on witchcraft and magic in their living room. I suspect that when the children bothered her, the woman cast spells on them. Sarah’s father realized the danger in that apartment and decided the family must never go back there. He took authority over Satan and plead the Blood of Jesus each time he went into the building. The girls were moved out temporarily and stayed With us. By Monday night, the move was complete and Sarah slept in her bed, which had been moved from the apartment. That night was the beginning of five days of unusual happenings. First, Sarah seemed to lose her confidence, saying she couldn’t do things. She started wetting her clothes and bed (she had been perfectly trained for months), and began to talk extremely loud. She then became hyperactive and began to lie. I woke up that same night with a splitting headache, which I never have. I was awake several hours and the Lord seemed to reveal some bondages of the little girl. I felt the enemy had taken over Sarah’s will and tormented her all night. We called our friends back for another deliverance session. First, the men took authority and ordered Satan out of the entire house, out of all their belongings, and asked God’s blessing on the house. Then they came against Seduction, Lying, Deception, Infirmity, Fear, Dumbness, Torment, Interruption, Insecurity, Depression, Hyperactivity, Restlessness, Mind-binding, and Fear of Failure. Tuesday night Sarah developed a bad cough. Her father anointed Sarah and prayed for healing. She coughed at night as though she couldn’t get a breath. Sunday she was still terribly congested and her breathing was hard and rasping. We ordered out Blood Destroying demons, False Deliverance, Spoiled, Rebellion, Death, and Infirmity. They really stirred and Sarah started to cry, got nervous, then her eyes rolled back, here eyelids closed and she slept. We bound all remaining spirits and asked her if she was hungry. Immediately, she was awake, alive, hungry, running, etc. After lunch, she took a three hour nap. We then took Elizabeth and prayed with her. While we had been praying commanding spirits out of Sarah, Elizabeth had screamed. She became fidgety, cried, squirmed and repeatedly rubbed her eyes and nose. After about 20 minutes, we bound remaining spirits. She contentedly ate her lunch and took a nap. She had very sore, raw buttocks for some time. We had tried different foods and remedies but it refused to clear up. When Elizabeth awoke the next day, the soreness was almost completely gone and her running nose had ceased. We are so thankful to have learned of deliverance through visiting Hegewisch Baptist Church and reading Battling the Hosts of Hell. I feel sure we will see even more changes in our lives in the future as God teaches us more. Demolishing the Hosts of Hell, © 1978 by Win Worley, W R W, PO Box 852626, Mesquite, TX 75185. 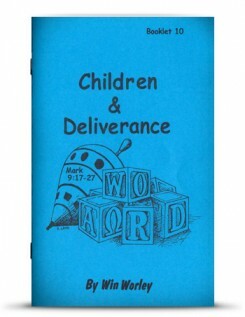 The following is an excerpt from “Children and Deliverance, Booklet #10″ by Pastor Win Worley. Copyright © 1983 by Win Worley, Revised © 1992. All rights reserved. No part of this publication may be reproduced or transmitted in any form or by any means, electronic or mechanical, including storage and retrieval system, without securing permission in writing from the publisher, WRW Publications, PO BOX 9309, Highland, IN 46322.